Who doesn’t love the views along Mountain View Road in Maleny? So many times I’ve driven visitors up there to take in the panorama of the Glasshouse Mountains, yet there is a view on the other side of the road that is equally as stunning. 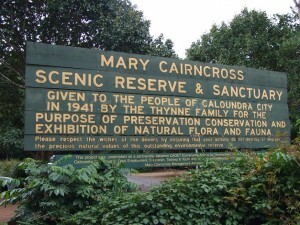 Mary Cairnscross Scenic Reserve is an area I have spent a lot of time in recently. When you first drive into the reserve, you could be forgiven for thinking that it’s just a big, beautiful park. It’s only wafter you venture further into the park that you realise that the park fronts a nature reserve that comprises 55 hectares of national estate listed subtropical rainforest. 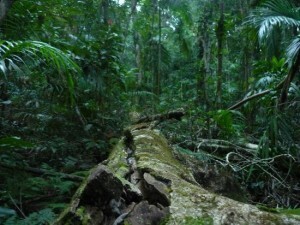 The rainforest itself is incredibly beautiful and is the reason I’ve fallen so in love with the area and its wildlife. The reserve is a living museum of incredibly diverse plant and animal life, with its tranquility and beauty that once covered much of the Blackall Range. Last weekend I decided to take the opportunity to pack up the family and go to learn more about the reserve and what it has to offer. When we first arrived we decided to take the tour through the ‘Through Time’ diorama held on site, which offers an incredible journey through 144 million years in the rainforests. It really is an incredible source of information on what Australia was like throughout the early and late Cretaceous periods and beyond, and of course, the many dinosaurs that once called the area home. The kids loved it. There was also some information on the back story of how the reserve came to be in the hands of the people. In 1902 Hon. Andrew Joseph Thynne bought a parcel of land on the Maleny plateau. In 1941 three of Thynne’s daughters,Hon. Andrew Joseph Thynne, gifted 40 hectares of rainforest from this land parcel to the public, in trust. Elizabeth Thynne gave a further 2 hectares in 1966. This was done to honour the memory of their mother, Mary Thynne, who passed in 1918. The deed requires the land to be kept as a nature reserve. Landsborough Shire Council (now Sunshine Coast Council) became the trustee and custodian of the reserve. 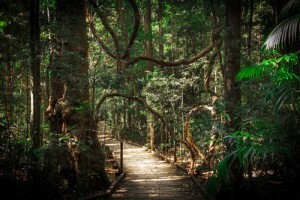 With support from the Rotary Club of Maleny, the reserve was opened for the public to enjoy. The Thynne sisters’ generosity has provided an incredible legacy and gift for future generations to enjoy and cherish. Interestingly, the Blackall Range itself was formed from volcanic activity about 30 million years ago, when basalt lava flows buried the landscape. The prominent peaks of the Glass House Mountains are believed to have formed from volcanic activity around the same time. They were once plugs of lava that cooled within volcanic cones. Erosion of the surrounding Landsborough sandstone has revealed the pre-existing landscape and details the unique formation of the Glass House Mountains. There are 14 mountains spread over 600,000 hectares, from Mt Coochin in the north to Round Mountain in the south. They include Mt. 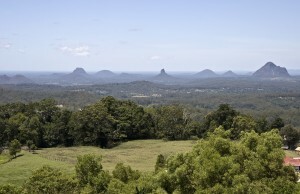 Beerwah (the highest at 556m), Mt Coonoowrin (377m) and Mt Ngungun (253m). Over all, there is an incredible wealth of knowledge held at the visitors center with something to peak the interest of anyone willing to learn. 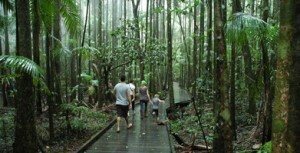 We finished our day with a walk through the beautiful rainforest walking trails that we had just learnt so much about. We discussed, as a family, all the little quirks of nature around us. Our eyes had been opened to so much more beauty and finesse in the mechanics of what surrounded us and my photography reflected this newfound appreciation. I strongly suggest to anyone interested to give the center a visit, there’s so much to learn and the diorama really is very well put together and engaging. 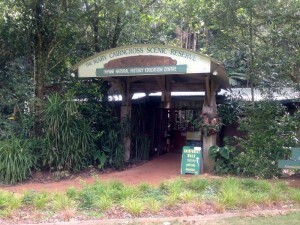 For more information see the Mary Cairnscross Scenic Reserve website.